My favorite scene is when Eddie sets a new distance jumping record and he flaps around like an eagle a nd has the best time of his life. This scene is uplifting and funny. I rate this movie a 5 out of 5 stars because it is inspiring and has a gripping story. I recommend it for ages 8 to 18 because there are some sexual references, like when Bronson makes an imitation of making love with a celebrity. There are also some injuries, like when someone tries to ski jump they fall and hurt themselves badly they can’t move. If you love adventure, and rooting for the underdog, go see Eddie the Eagle in theatres near you! I was truly delighted to watch the new film, Eddie the Eagle because it is an astoundingly energizing and powerful film. I l ove to watch films based on true stories and this is an unquestionably good one. In this film, you will see the story of Michael “Eddie” Edwards, an Olympic British ski jumper and learn how his determination enabled him to participate in the 1988 Calgary Winter Olympics. The Good Dinosaur – Finding Your Roar! The Good Dinosaur, which will be released on Blu-ray/Digital HD on February 23, asks the question: What if the asteroid that forever changed life on Earth missed the planet completely and giant dinosaurs never became extinct? In this epic journey into the world of dinosaurs, an Apatosaurus named Arlo makes an unlikely human friend and learns the power of confronting his fears and discovers what he is truly capable of. KIDS FIRST! Film Critic Ryan R. (age 11) comments, “I like how it touches our emotions and admit that it made me cry in some parts. I also liked the jokes because they are really funny.” Gerry O. adds, “The whole plot is a large and exciting adventure which allows for some mild action. There is a bigger moral to the story which is “discover your voice.” See their full reviews below. I really enjoy watching the new Blu-ray of The Good Dinosaur. One thing I loved about this Blu-ray is the deleted scenes. I love how the director explains why certain scenes didn’t make it in the final cut. I enjoyed the Dino bites, which is a short showing the characters goofing off. I also enjoyed watching the trailers of The Good Dinosaur in different languages. It was interesting knowing that there are different names for this movie in other places. There was nothing to dislike about this Blu-ray. This 3D, computer-animated, adventure, dramatic comedy is very emotional and funny, a perfect movie for the family. The story is about what would happen if an asteroid missed the Earth and never killed the dinosaurs. In the movie you meet Arlo (Raymond Ochoa) who is a very insecure, scared dinosaur until he is able to find his roar! He meets a human kid named Spot. Something happens. Arlo chases Spot and falls into the water taking Arlo very far away from his family. Will Arlo make it back to his family or will he be lost? I enjoyed this movie. I like how it touches our emotions and admit that it made me cry in some parts. I also liked the jokes because they are really funny. I love the action scenes that involve the water. It kept me on the edge of my seat. My favorite character is Arlo. He is a very ecstatic, extremely compassionate dinosaur who learns to face his fears. Arlo is very relatable because everyone has fears and people think it is silly but it isn’t. I love that he is very motivated. I love how he changes throughout the story. The moral lesson in this movie is you can discover what you’re truly capable of if you are willing to face your fears. Arlo proves that in this movie as he “finds his roar.” On the Blu-ray, there are bonus features, deleted scenes and shorts. The shorts include Sanjay Super Team, Dino Bites and Hide and Seek. It also tells you facts about dinosaurs and many more. Another feature are trailers of the movie. My favorite short would be Sanjay’s Super Team, because this short told its story without any dialogue and delivered an important message about dealing with old family traditions and the modern world. I give this film 5 out of 5 amazing stars and recommend it for kids ages 5 to 18. Adults might like this as well. I also recommend this to kids who like family, action, adventure, drama, comedies, dinosaurs and Disney movies. Check out the Blu-ray when it comes out on February 23. What if? That’s the beginning of this film with its spectacular scenery, a beautiful soundtrack, an exciting story and so much more. What I really love about this film is the animation. A good 20 minutes of the film is dedicated to looking at the scenery, which is incredible. The design of the landscape, with its hills, valleys, mountains and rivers is truly breathtaking. The story starts when an infamous meteor hits the Earth. Millions of years later, a dinosaur named Arlo is separated from his family and home. He goes on a huge adventure to get back home, which involves enemies, friends and more. The story is dramatic and takes turns that surprise the audience multiple times. The voice acting is excellent in every role, making characters sound alive, personable and full of energy. One of my favorites is Butch (Sam Elliot). Butch is a T-Rex and a pretty cool one too. Sam makes him seem menacing and dramatic, but still friendly, even a bit funny at times. In the Blu-ray version, there are a dozen special features, including an option to listen to commentary throughout the film from some of the creators, including storyboard artists and editors talking about the process they used to make the film. A perfect example of this is when they discuss how they based the terrain on the western United States. The special features also include deleted scenes and some cool interviews. My favorite scene is when Arlo meets the T-Rexes. He and his companion, Spot, are running away from scavenger birds. They see a dinosaur in the distance and plea for help. It turns out they find two powerful T-Rexes and the T-Rexes assist Arlo and Spot to get to safety and on with their journey. The staging in this scene is intense and dramatic, especially when you don’t know if these giant carnivores will be more dangerous than the birds. This film is most suitable for ages 6 to 18. Younger kids may find the more intense and dramatic scenes way too frightening. I give it five out of five stars for its beautiful animation, emotional voice acting, an intense story and smooth editing. The Good Dinosaur is being released on Blu-ray and Digital HD February 23 so, keep a lookout for it. Posted in DVDs Released | Comments Off on The Good Dinosaur – Finding Your Roar! Disney’s Beauty and the Beast Musical On Tour! The original creators of the Broadway production are together again for this new touring production! Disney’s Beauty and the Beast is the classic story of Belle, a young woman in a provincial town, and the Beast, who is really a young prince trapped in a spell placed by an enchantress. If the Beast can learn to love and be loved, the curse will end and he will be transformed to his former self. But time is running out. If the Beast does not learn his lesson soon, he and his household will be doomed for all eternity. KIDS FIRST! Film Critic Tre’ana H. comments, “Beauty And The Beast is a phenomenal musical based on the original classic story. It draws you in and makes you a part of the scene.” See her full review below. For a full tour schedule, sheck out http://www.beautyandthebeastontour.com. Beauty And The Beast is a phenomenal musical based on the original classic story. It draws you in and makes you a part of the scene. I enjoyed this because it is filled with drama, thrills, romance and some action. The rose is symbolic with its blue, gloomy background and the transformation is great. Will the rose be back with love or sadness? This musical touched my heart because of its message – you should treat people the way you want to be treated. The director, Rob Roth takes you through turns and twists but the outcome is grand. I appreciated this musical because it is hilarious and interesting. The beast (Sam Hartley) is a prince who is spoiled, selfish and lonely. When the spell is cast upon him he becomes a mean man. Belle’s father goes into the forest trying to attend the inventor’s competition and gets lost in the forest. The wolves try to eat him but he stumbles upon a castle where the servants let him in. The beast are very cruel to Belle’s father and put him in the dungeon. Belle (Brooke Quintana) tracks down her father to the horrible beast castle and he agrees to let her father go if she will take his place as a hostage. What an amazing thing to do? Will he kill her or let her survive? The beast costume is gothic and eerie. The townspeople and servant costumes are illuminating with bright colors that captivate you. The lighting design by Natasha Katz excels in every scene. The set designs by Stanley A. Meyer are mysterious, colorful and gloomy. The music by Kevin Francis Finn is truly breathtaking. The message of the musical is to treat people fairly and, if you can help someone, extend that extra hand and you will be blessed. My favorite scene is when the beast turns into a human and floats above the stage and transforms into a young man. This is fantastic! You will not believe it! I recommend this play for ages 8 to 18 and I give it 5 out of 5 Stars because it is full of excitement. I really enjoyed it and you will too, so put this astonishing musical on your todo list. You will not be disappointed. Posted in Family News | Comments Off on Disney’s Beauty and the Beast Musical On Tour! This animated film seems a bit slow at times and honestly, at first it seems that the film is simply about a bunch of kids entertaining themselves on winter school break by having a major snowball fight. But, it is packed with some very powerful life lessons and messages. The characters are entertaining and their resourcefulness quite amazing. The film starts out on a frivolous note but takes a serious turn and has some consequences. However, this is when the characters learn about friendship and even more important messages. KIDS FIRST! Film Critic Ryan R. comments, “I appreciate this film because I love how it shows a beautiful, snowy village and the kids in this village having fun in the snow.” Morgan B adds, “…there is a message and everyone will get it. It is one, which we should all know.” See their full reviews below. I love watching the new film Snowtime. This film is one to watch. In this film, it is winter break and Luke (voiced by Angela Galuppo) and his friends prepare for an epic snowball fight. They divide themselves into two teams. One team builds an amazing snow fort and the other team wants to win the snowball fight to claim ownership of the fort. Watch these two teams go head to head in this snowball fight to see who gets to win and claim the snow fort. Who will win? Who will lose? 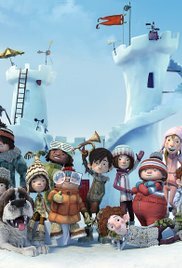 I appreciate this film because I love how it shows a beautiful, snowy village and the kids in this village having fun in the snow. I also like the fort the kids make in this movie. I love the characters. They are silly, quirky and sometimes bashful. I also liked their appearance and how they are drawn. The jokes are also funny; this is another great film for kids. I really enjoyed the scenery too. The moral theme in this film is an important one. Basically, there are no winners when it comes to war. The kids end up learning this lesson. Their friendly snowball fight soon takes an ugly turn which leads to some serious conflicts and a surprise. I think there are other life lessons in this film but that is the main one that stands out for me. My favorite character is Nicky (voiced by Liz MacRae). When Nicky shares his ideas with his friends, they underestimate him and knock his ideas down. I love that he doesn’t allow what they say to discourage him and he continues on his own and accomplishes his idea. I respect his persistence and how he collaborates so well with his friends. I enjoyed how he makes things and they turn out well. I appreciate his imagination. I can relate to him because people sometimes knock down some of my ideas too. But I continue to go forward with my ideas and prove them wrong. I give this movie 4 out of 5 stars because the animation is great and it has an important message. I recommend this to kids ages 3 to 18. I think adults might like this as well. I also recommend this to people who like family, comedy, adventure and action movies. Mark your calendars for February 19, 2016 when Snowtime opens in theaters. It is 90 degrees in Los Angeles California and 48 degrees in Colorado and it is winter for another month, with snow falling in other states. What is a group of kids to do over winter break? Have a snowball fight, of course. The group splits into two teams and away we go. The story line is great. We got a glimpse of the backstory of characters and learn what motivates them and makes them who they are. I have two favorite characters. The first is Sophie voiced by Luchina Paris. She is the older sister and is always coming up with a plan to defeat the other team. My second is four eyes because of his crazy glasses. Many of the best parts of the movie are due to his ingenious inventions he makes to keep the fort in his team’s control. They are creative and awesome. I would have picked his team just to see the inventions he made – slides, escape hatches, automated snowball throws and traps to keep the other team on their toes. The story line has a bit of a love story angle but seems to fizzle out and is not completed. If they make a part two I hope they continue this story line and leave it with a better conclusion. I loved the graphics and animation. It is believable and easy to watch. You forget the characters are animated and look at them as if they are real people. The fort, well let’s say it is the most awesome snow castle ever and I would love to play in it. Most children’s movies are fun, cute and quirky and leave you feeling upbeat. This movie left me feeling sad. I loved the movie but I did not like the ending. No spoilers, but I wish they had added more to the ending of the movie. But, there is a message and everyone will get it. It is one which we should all know. I recommend this movie for ages 6 and up. Younger kids might not totally grasp the story line but they will love the graphics and a good snowball fight. I give this movie 4 1/2 out of 5 shooting snowballs. This movie is brought to you by Shout! Factory and opens in theaters March 29th. The DVD will be out in the fall of 2016 just in time for the next winter snow fun. Hail, Caesar! follows a day in the life of Eddie Mannix, a Hollywood fixer for Capitol Pictures in the 1950s, who cleans up and solves problems for big names and stars in the industry. But when studio star Baird Whitlock disappears, Mannix has to deal with more than just the fix. KIDS FIRST! Film Critic Gerry O. comments, “What happens when you mix legendary actors, an original story, smooth and hilarious script and two of the greatest directors of all time, the Coen Brothers? You get Hail, Caesar! – an absolute hilarious masterpiece that I absolutely adore.” See his full review below.